The Worlds Most Beautiful Oversized Large Framed Mirrors! PROBLEM! Where to order large framed mirrors? Do you need an oversized floor/wall mirror for a space in your home or office? Many think of using artwork in open spaces but many times a mirror is better. However, most companies do not offer large mirrors, what can you do? 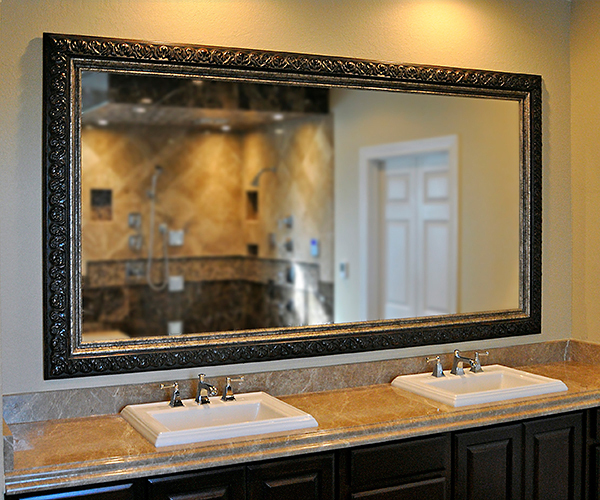 Texas Mirror builds oversized and very large custom framed mirrors. Many Online companies only offer mirrors up to 40 by 60 inches. When you think about it, that is not very big. Not all frames we offer can be manufactured into super big mirrors but many are suitable. 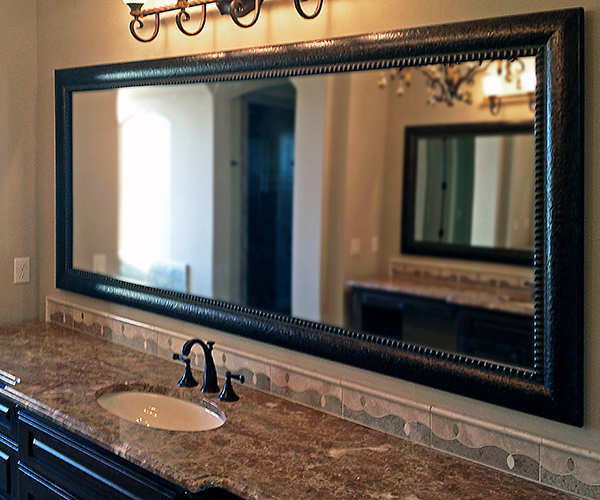 Many need a mirror that will look great on an open wall, over a bar area or a bathroom cabinet. We can help! Oversized Mirrors take about two or three weeks to produce, but it is worth the wait. If you find a frame you love, call us and we can tell you how big we can make it. Additonal charges apply for shipping and installation on oversized mirrors..
We create the PERFECT Oversized mirrors for your decor. Call us today! Do you have a large bar area that needs a large framed bar mirror? We offer great frame options for matching your bar area decor. One of our frame collections is natural woods. Many times we can match your cabinets with a perfect frame. If you have outlets or switches in your bar area, its no problem. 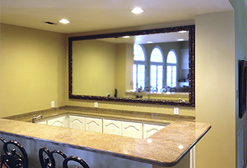 We can measure your large bar mirror to fit around most objects for perfect fitting. 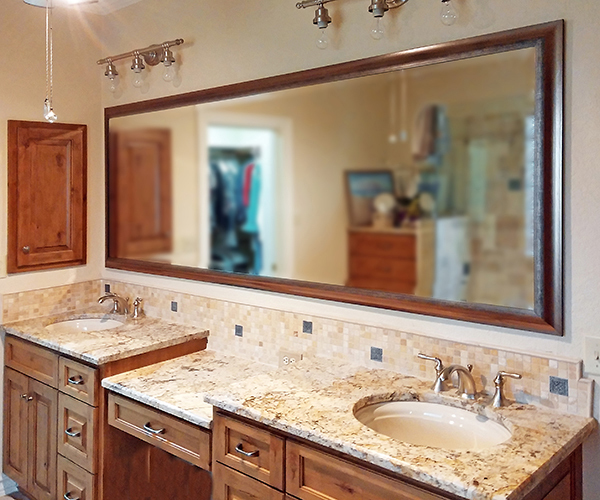 Have you considered using a tall or large framed mirror above your vanity sink or cabinets? 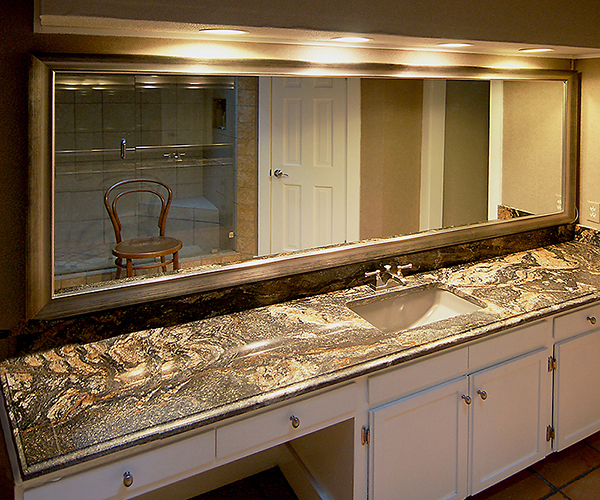 We build large bath mirrors in a number of silvers. Do you need a stainless steel or nickel finish to match fixtures? 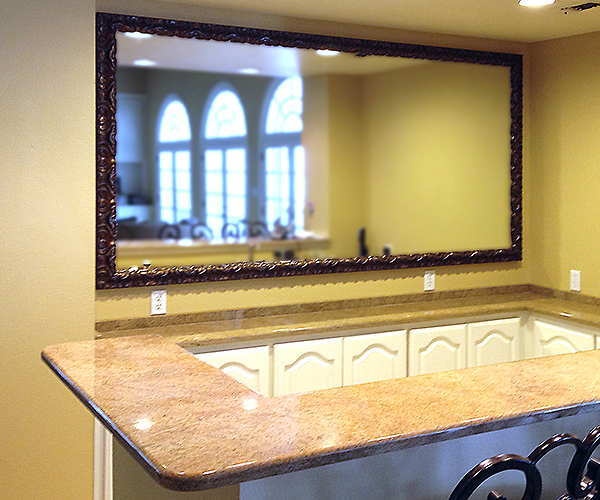 Our oversized mirrors can span from the counter top up to the light fixture. 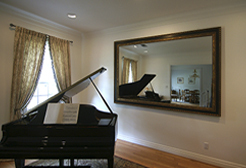 Some customers need very large framed for piano rooms, entertainment living room areas. 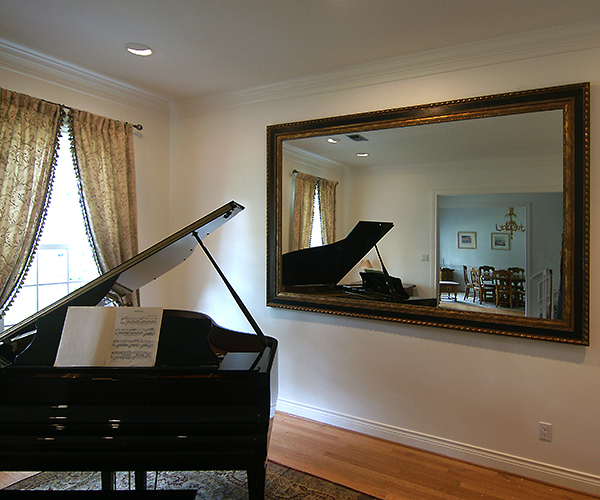 Above is a photo of a large piano room that we built a 110 by 60 inch double framed mirror with beveled glass. This is an example of how a custom design can compliment your living areas. 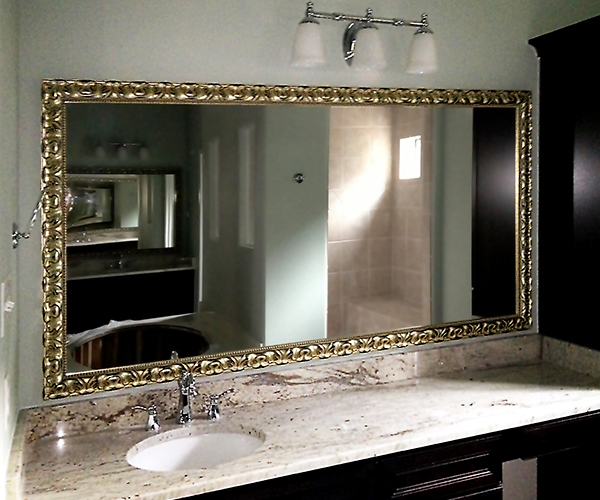 These mirrors are very heavy and we offer full installation services if you desire. Schedule a personal appointment today! 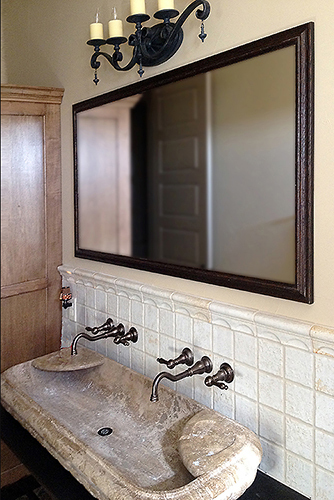 LEARN ABOUT DELIVERY, INSTALLATION AND ORDER INFO OF OVERSIZED FRAMED MIRRORS! Nationwide Shipping or delivery and installation in all areas or Texas except extreme west Texas. We will quote you on shipping or Texas delivery. Rates vary. 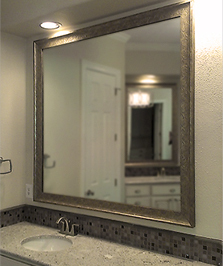 Installation rates for large mirrors range from $89 to $200 depending on size and location in Texas. Large mirrors are very Heavy! The Z- Bar that we send is Super Heavy duty for extra strength. Our screws are heavy duty and is a good idea to use all the screw openings we design for. FIRST: Oversized is any size over 40 x 80 inches in either direction. SECOND: You will notice the calculator will only allow a maximum size when ordering. However, if you call we can make larger many times. You must call us. THIRD: Any frame you might choose needs to be at least 3 inches wide and 1.5 inches thick. FOURTH: There might additional shipping charges specifically outside of Texas. Very large shipping crates must be built. FIFTH: Please review the How to Measure Mirror . This page reviews measuring. However, it is important with Oversized orders you leave last 3 inches form any side wall, light fixture or any obstruction as they are very hard to install.